Address: Guanapay, 5, Puerto del Carmen (Lanzarote), Islas Canarias. Situated just 250 metres from Grande Beach, the R2 Bahia Kontiki offers an outdoor swimming pool surrounded by gardens and a sun terrace. All accommodation features a balcony. The R2 Bahia Kontiki site has a restaurant and bar where guests can enjoy light refreshments. 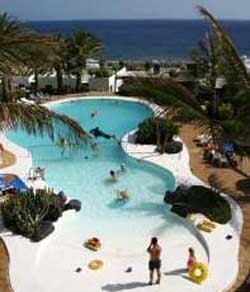 The main resort of Puerto del Carmen is within 10 minutes’ walk with many restaurants and shops. Bicycle and car rental can be organised at the 24-hour reception. Here staff can provide you with information on Lanzarote, as well as helping you book excursions and activities. The apartments are located just 200 metres from the seafront promenade, Avenida de las Playas. Many water sports are available throughout the year on Playa Grande Beach, including water skiing and jet skiiing.